Something any new runner learns early on is the importance of having a plan. Training for a long-distance race is not as simple as putting on shoes and running. Whether it’s a couch to 5k program or a full 12 week half marathon training program, you must have some sort of plan for building up your strength and endurance. With the amount of available information on training plans, picking one is not usually the problem. Once I had a plan for my running, I discovered a new challenge: trusting the plan. It was difficult for me to hold back during my training when I kept thinking about the overall goal of running a half marathon. How was running three miles over and over going to help me reach my goal? I had an overwhelming urge to keep pushing my pace and my distance more than the plan called for. I didn’t trust that the process I had in place was going to be enough. I had to keep reminding myself that I needed to keep taking small steps to avoid overuse injuries, which would set me back even more. It wasn’t until two-thirds of the way through my training that I was able to look back and see how far I had actually come since I started. My progress was actually surprising to me. The same can be true for you and your team as you pursue your long-term goals. If you trust the process you have in place, and focus on executing the small steps of your plan, you will be surprised at the progress you can make. If you push too hard, too fast, you risk burning your team out and slowing your overall progress. Taking shortcuts can lead to mistakes and rework that derails your efforts. It takes time to build up to long-term goals and your plans and activities should reflect that. Trust the process. Maintaining a consistent pace is something I am very good at as a runner. Once I set a certain pace, I will stay locked in at that speed for miles. Unfortunately, I have found that this hurt me in my training over the years. There are actually a lot of different types of training runs in a balanced training plan: Long runs, tempo runs, speed work, recovery runs, hills, fartleks (one of the funniest words in sports). Each of them has a different purpose. In some cases you are working on building strength. In others, you are working on endurance or speed. They are each designed to provide a very specific benefit that will help you reach your racing goals. When I was training, I had the problem of running every training run the same way. The distances changed, but that was about it. I didn’t understand the purpose of what I was doing, so I wasn’t able to get the maximum benefit from it. It wasn’t until I learned more about training techniques and the differences in the workouts that I was able to take full advantage of my training. My running ability took a big step forward when I varied my workouts appropriately. We need to have the same understanding of our activities when we are pursuing any long-term goals. Why are we doing what we are doing? How will our activities help us achieve our goals? Should we be doing them a certain way to obtain the benefit? Should we stop doing any activities that will not help us achieve our goals? If we don’t understand the relationship of our actions to our goals, we may be wasting our efforts. As my training progressed and became more intense, I learned the importance of aligning everything in my life towards my goal. I needed to eat right, sleep more, and make time for training. If my body wasn’t in peak shape, I was going to struggle. I had to plan parts of my life days or weeks in advance to make sure I was set up for success. At times, this involved saying no to things I would otherwise have liked to do. Other times, it gave me an excuse to do things I did like (hooray for carb-loading!). The goal of running a half marathon became somewhat consuming as race day approached. Any challenging, long-term goal that we are pursuing is likely to require this same type of dedication. We must align all of our efforts, and those of our teams, to the goal we are pursuing. It may even require that we say no, or not now, to other efforts or issues that we would like to work on. I have seen this principle apply at an organizational level frequently. If everyone in your organization is not on the same page regarding goals and priorities, you will struggle to make progress. Each team will have their own ideas as to what should receive their attention. As a result, there will be constant battles for resources and little progress will be made. If everyone is aligned, amazing things will happen. 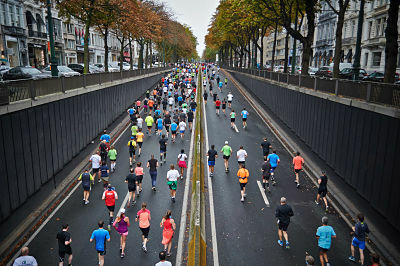 Long-distance running can be a very peaceful and relaxing activity. It can also be very boring. And hard. The best part of my training for the first few races I ran, was that I was surrounded by a wonderfully supportive group of experienced and beginner runners. They kept me accountable for keeping up with my training through our weekly long-runs. We kept each other company and encouraged each other when we were struggling. Some days, this camaraderie was the only thing that kept me going. It was amazing how 12 hilly, challenging miles run with a group could feel easier than 9 flat, easy miles run by myself. I’m not sure I would have made it through my first race without them. I certainly wouldn’t have performed as well or enjoyed it as much. Not running alone made a huge difference for me. If you are pursuing an individual goal, don’t forget how helpful others can be. Try to surround yourself with friends who can pick you up when you are down and encourage you when things get tough. Tell people about your goals so that they can check in with you and keep you accountable. If you are pursuing a team goal, don’t forget the importance of team chemistry. Spend some time on team-building activities. Try to foster a sense of community. Your team will perform better if they know they are in it together and trust each other. I’m sure there are other lessons I have missed. I have certainly grown significantly through my running efforts. I would love to hear if you have had similar experiences. Have you learned any other lessons from your hobbies or personal experiences? Please share them in the comments or via email at [email protected]..
Sign up here if you would like to be notified of new posts via email.